I’ll be in Brussels, Belgium for the week starting on November 10th. Anyone want to meet up? I’ll then be at OLPC France CodeCamp on November 15th in Paris (announcement). No time to spend in Paris unfortunately, I’m flying back to the UK right after, but hopefully I can put some names to faces at OLPC CodeCamp. 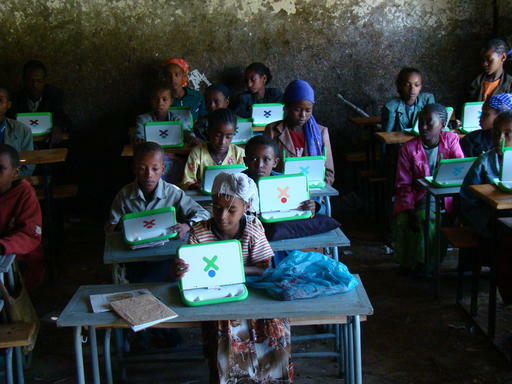 The ecbp team started the 2nd OLPC Ethiopia deployment today. 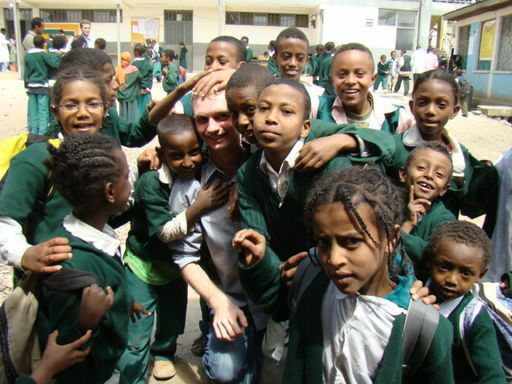 This time, we are working at a school in Addis Ababa. The school itself is similar to another local school that I wrote about in my first week, although smaller (approximately 1000 students, rather than 2800). Both through mistakenly thinking this school was a public school, and also through the radiance of this photo, I was expecting the school to be more modern and have better facilities than the others I have seen. However, upon arrival I learn that this is another government school, and the facilities are strikingly bare. As we walk into the school, the first thing that hits me is the noise of many chattering children. I ask my coworkers if this is their break (although I am doubting that myself, the schoolyard being mostly empty). “No, this is how they learn in class.” The teacher yells a question, and the kids all yell the answer. Or the teacher yells some kind of statement, and the kids repeat it. Over and over again. With many classes in a small area, it’s just a mess of (Amharic) sound. Later on, I am within earshot of an English lesson. “HOW ARE YOU”, yells the teacher. The kids respond in unison, “I AM FINE THANKYOU.” This repeats indefinitely, almost army-like “SIR YES SIR” style. We spend the morning conducting questionnaires, which will generate data for evaluating the effects of the laptops (more data will be collected some time later, and data will also be collected from schools without laptops). Then, we start deployment in the afternoon. Things are nicely organised, with the kids coming up one by one, presenting signed letters from their parents, and signing for their laptops. They obey instructions to not power on the laptop until everyone in the class has signed for their XO. The teachers give out 200-300 laptops in total, with only a little assistance from ourselves. Chaos ensues as classrooms full of children eagerly power on their laptops for the first time. The Ethiopian team explain that the children must type in their name, although some children do not seem to understand. I use my minimal Amharic to help them out, but it’s difficult and things get harder as the other children get into Sugar and make noise as they start exploring. “Teacher, teacher” they say, pulling at my clothes. I turn to them and am greeted with “Camera, camera!” as they beg me to show them how to open Record (an instant hit). Overall, it was a very tiring day, but a lot of fun, and rewarding to see so many happy children. Students from other classes hounded me for laptops as we left; we will return on Monday to finish the job. 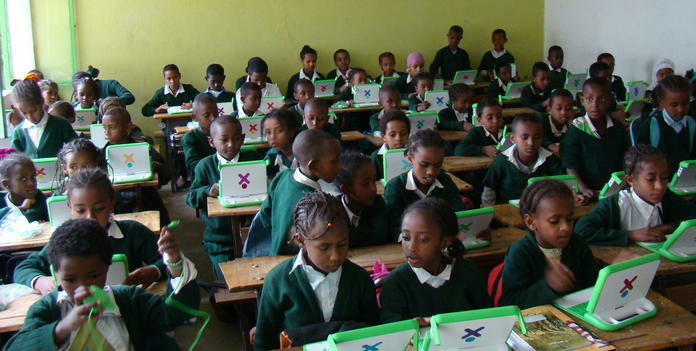 Last weekend, I wrote about Ethiopia’s first OLPC deployment. We’ve been back to the school several times since, so I have a few stories to share. Firstly, Prof Tom Postmes and Dr Nina Hansen visited. They are starting a research project at the University of Groningen to measure the effects of the XOs on the children. On their journey to the school, they describe how they saw a child in a field, tending to his cattle. In one hand, he has a whip for controlling the animals. In the other? An XO. The researchers were also intrigued by the way some of the children were using the Record activity. Some of these children do not have access to mirrors, and were using Record to look at themselves. Being social psychologists, Tom and Nina were excited about the changes this will have on the childrens’ self-perception and self esteem. Back at the office, the OLPC Ethiopia team worked on creating content bundles of the regional curriculum textbooks for the school. They have acquried 39 of the textbooks (grades 2 through 8) as PDF. On Friday, we went back to the school and showed the teachers how to install them (using a customization key). We decided to add the WikipediaEN activity along with the textbooks. In addition to a heap of textbooks, 600 kids in the middle of nowhere now have 8500 of the most popular Wikipedia articles in their hands. The children learn English from an early age, so I’m confident that it will be of use. The reborn children have not yet received any tutoring about the laptops. Although they have figured out an incredible amount for themselves, they did not seem to have figured out the collaboration features. So, we gathered 15 or so children in a classroom, and showed them how to set up shared Chat, Distance and Write activities over the mesh. They were ecstatic. 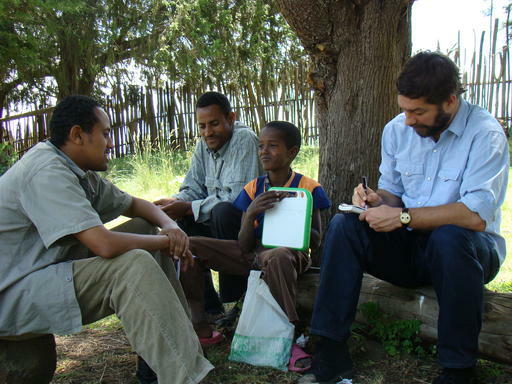 We told them to tell all their friends, and then we returned to Addis with high spirits. Plans with other schools are progressing. The Ethiopian way of life is simply less organised than what I’m used to. It’s normal here for people to turn back on their plans, multiple times. Assuming plans stick (hah), I should get to see at least one more deployment.